While feeding the birds this morning a new visitor flew right by me then banked swiftly into a 360° turn to land in the ponga tree between me and the house. I couldn't believe it! 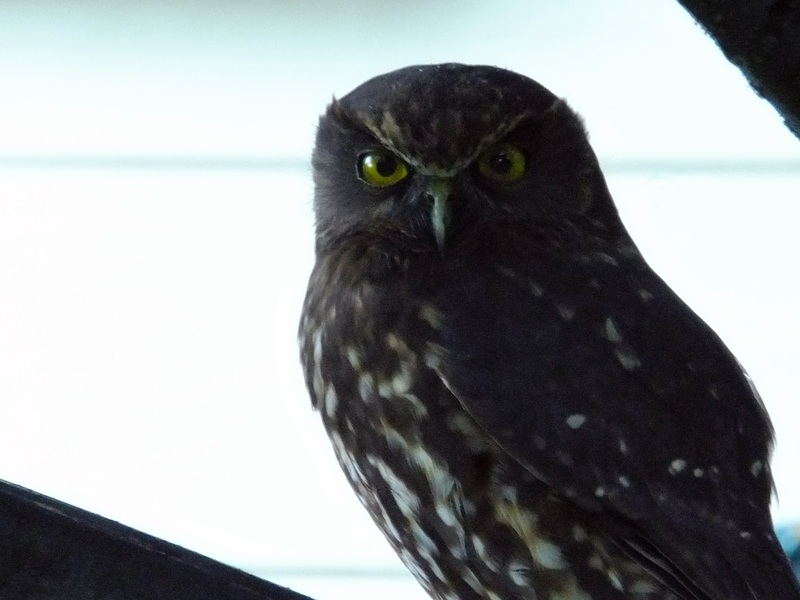 Our neighbour had told me a couple of days ago that there was a ruru sitting in the tree below their house so I'll have to assume she's continued to hang out in the area (the ruru that is!). The other birds were rather vocal about her presence with two making a squawky warning sounds. Not surprisingly as the ruru was likely hunting them. 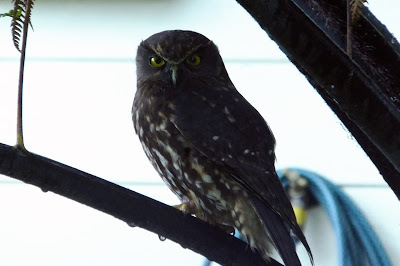 Ruru are usually nocturnal so very unusual to see her out at this time of day (around 7.45am (dawn was 6.52am)). She sat on the ponga branch for a while and watched the blackbirds eat kiwifruit not even too bothered by my presence and when she looked directly at me I was stoked as, what a look!! She kindly waited for me to go and get my camera and again looked straight at me for the shot. Rather special as the ruru (also known as more-pork) is New Zealand's only surviving native owl and although we hear them often this is only the second one I've seen in 11 years here. I was on a natural high for some time after this wonderful encounter. Woohoo. I've named this photo our watchful guardian because In Māori tradition the morepork was seen as a watchful guardian. It belonged to the spirit world as it is a bird of the night. Less cropped version with the hose behind!